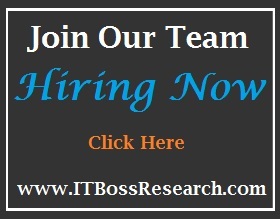 IT-Boss Research is always looking for qualified individuals to become independent contractors for our clients. When you apply with IT-Boss Research, you'll know that we are working hard behind the scenes to match your skills with just the right client. When our clients are looking for unique skills, we'll help you find the training to develop those skills. When you apply to IT-Boss Research, there's no membership to join, no dues to pay and no application/placement fee. Our recruiting and placement services are paid by the client and never an expense to you. Since 1991, IT-Boss has continued to be instrumental in meeting the evolving challenges of today's workforce by creating a virtual office which focuses on bringing together job seekers and potential clients for the purpose of establishing long-term working relationships. To accommodate the demands and ever increasing need for public information, the IT-Boss Research division was established to focus strictly on the every-growing need for court research and document retrieval. IT-Boss Research is an ethical company which strives for a moral code of business: Honesty, Integrity and Quality. We're a small, but powerful woman-owned home-based business promoting independent contractors to supplement our client's increasing staffing needs. We are passionate about delivering superior quality, service and choice to our clients and customers: our reputation and the loyalty of our clients and customers depend upon it. God brought you this far, it's up to you to do the rest. Need more information before applying? Click here to read more information about being a Court Researcher.